Michael Phillip Cash: Stillwell Is Ranked Number Three On Amazon! Have you read my book, Stillwell: A Haunting On Long Island yet? It is currently ranked #3 on Amazon.com under ghost. I am so grateful to all of you who have left such great reviews about my book. I want to share some of those today with you. "His descriptions of paranormal activities were believable, and not overdone. I found myself becoming involved with the characters and relating to their thoughts, feelings and personal dilemmas. I thought I had the end figured out, but was wrong, and was therefore delighted with the way the author pulled in all the loose ends. Although Stillwell is the suspenseful story of a haunting, it is also a well-written love story. 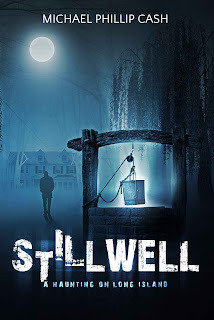 For readers who are looking for an entertaining, and somewhat thought provoking novel, particularly if you enjoy anything paranormal, I recommend Stillwell, without reservation." ~Karen B. "If you like ghost stories, and love stories, if you are a parent or a sibling or a child, you will relate to this book. This author has the ability to reach out from the page and touch you on so many different levels. The book opens after the death of the main characters wife, Allison. The pain he is going through and how it paralyses him is so real that you are immediately connected to his pain and his inability to get moving. "I enjoyed this read once I got into it. I loved the locals and the way the author described them giving you a mind's eye picture of where you were.The characters were also well done and the description of them definitely brought them to life. It was quick paced, taking you from one event to another, building up the suspense and leaving you wondering, wanting to know. The story had sorrow for sure, but it was packed with suspense, mystery, paranormal events and a satisfying ending. I recommend this read, I believe you will enjoy it." ~Shirley J. If you have not read my book yet, you can get it on Amazon.com for 99 cents in e-book form! If you have read it, I would love to get your feedback. Please leave a review on Amazon!